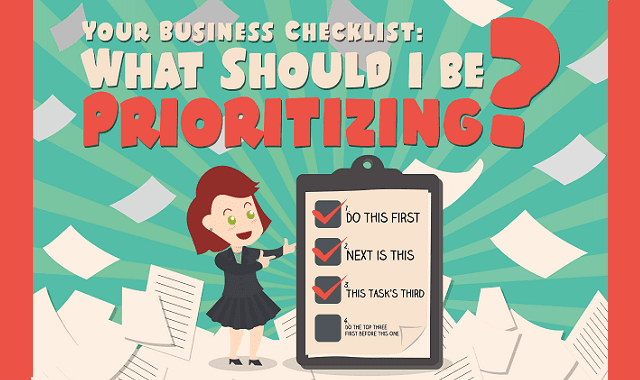 Your Business Checklist: What Should I Be Prioritizing? #Infographic ~ Visualistan '+g+"
Before starting a business, entrepreneurs should know what to prioritize in terms of management, products, and services. Apart from keeping the company organized, this also allows them to set a goal, which could improve their venture’s resource and revenue. Most entrepreneurs, however, fail to determine basic business priorities. Even if they do, they sometimes forget to maintain such priorities, which leads to miscommunication and disorganization. This shouldn’t be the case, especially for entrepreneurs that wish to leverage their businesses. Setting goals and priorities isn’t a one-time task. It’s a continuous responsibility that affects owners, clients, and employees alike. As a result, entrepreneurs should balance their businesses to keep priorities straight and businesses well-communicated. Run a thriving business by knowing what to prioritize. In this infographic from SlideGenius, know what you have to prepare and take care of for the long haul. Don’t lose focus and keep your business smooth- sailing.